I'm a huge fan of Japanese food. From sushi to teriyaki, I love pretty much every dish I've tried. And with a trip to Japan booked for August, the prospect of discovering and trying more Japanese dishes was an opportunity that I leapt at. It was a truly delicious experience, and my friend and I left very content. The supervisor, Yubuui, was incredibly helpful in sitting down with us and going through the entire menu, so if you spot her on your visit, definitely ask for her help! The drink choice was surprisingly extensive - there were your typical cocktails and beers, but all had unique Japanese twists! I had the Virgin Yuzu Mojito which was so tart but sweet (the perfect balance! ), and my friend had the Shiso Tonic which is a gin and tonic with added sake. For starters, my friend went for the Wagyu Bun and I chose the Takoyaki. The Wagyu Bun was small but packed full of flavour. 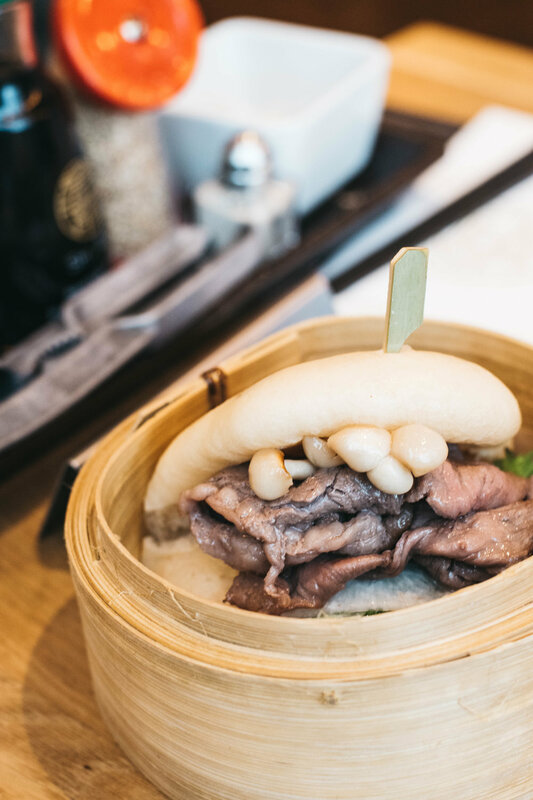 The beef was really tender and combined with the soft bun, it was a great combination! The Takoyaki was delicious. 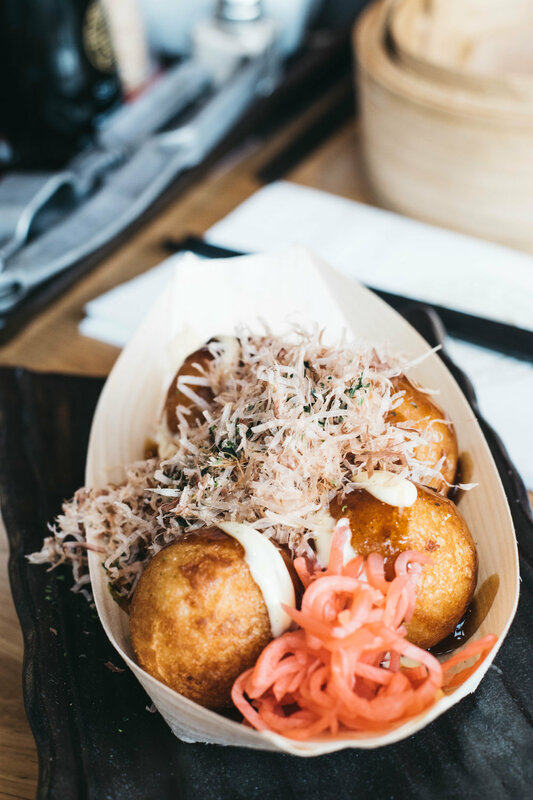 Takoyaki are little balls that often contain octopus, and are dressed with takoyaki sauce and dried fish. It was amazing. I haven't had Takoyaki in years and this was no disappointment! Each ball was really flavoursome and could have satisfied me as a meal so it was a wonderful starter. I haven't had takoyaki since I was living in Bangkok (7 years ago! ), so it's definitely something I'll be going back for. For mains, we both went for ramen. I decided to go for the signature Shoryu Ganso Tonkotsu and my friend chose the Miso Wafu Chicken. The Tonkotsu was delicious. 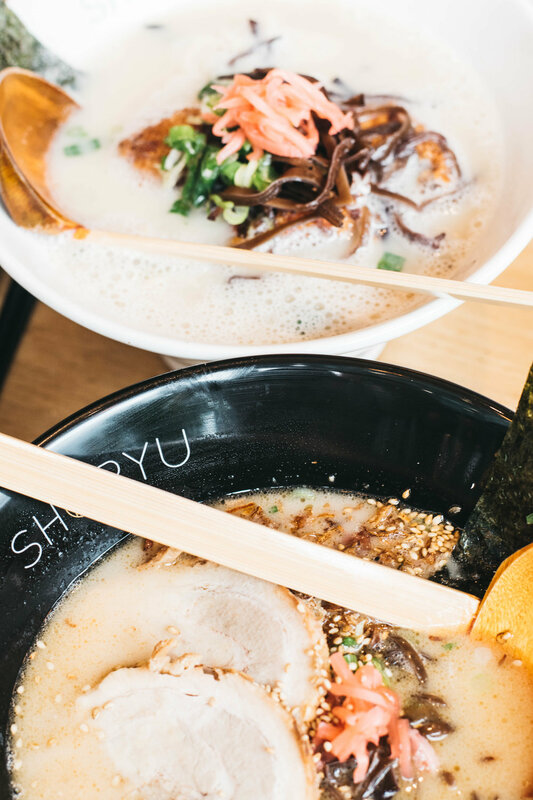 Tonkotsu is made with flavoursome pork broth and was topped with soft boiled egg and melt-in-the-mouth pork belly. I was slightly apprehensive about the pork belly, but it melted in the mouth and didn't have any chewy fat or gristle. The dish was surprisingly filling, and was just incredible! I've only ever had ramen with chicken breast so the tonkatsu was a welcome alternative! The Miso Wafu had a miso soup base and fried chicken - which my friend thoroughly enjoyed! My plus one is dairy intolerant so the Miso Wafu was perfect for her! And for desert - to be honest, by this point we were so full that desert was definitely not necessary! My friend had the Yuzu Sorbet which had a kick similar to that of which you get from a Gin and Tonic. It was the perfect desert for summer - very refreshing. I had the Yuzu Cheesecake which to be honest, was almost indistinguishable from a lemon cheesecake - so it was a bit of a letdown. But like I said, the savoury are definitely the highlights of Shoryu and you probably won't need nor want a desert by the end! The food was all wonderful, and despite my critique of the cheesecake, the ramen and starters were absolutely delicious! The location in Piccadilly Gardens is perfectly central - although if you're going with a group, I'd suggest booking a table. Thank you so much to Shoryu Ramen for inviting us - we had a wonderful time!